Tra una serie di interessanti filmati, ed alcune promesse circa degli scomodi contenuti presenti nel gioco, qualcuno trova il modo di proporre tutti gli Obiettivi che sarà possibile sbloccare giocando a Call of Duty: Black Ops. L'intera lista, come di consueto, la troverete dopo la pausa. Quanto visto sino ad ora ci induce a sperare in qualcosa di positivo, visto e considerato anche l'indubbio passo in avanti fatto da Treyarch da Call of Duty 3 a Call of Duty: World At War. Come buona parte di voi certamente saprà, peraltro, in Black Ops verrà abbandonato ogni evento afferente la Seconda Guerra Mondiale, così come già avvenuto per i due Modern Warfare. 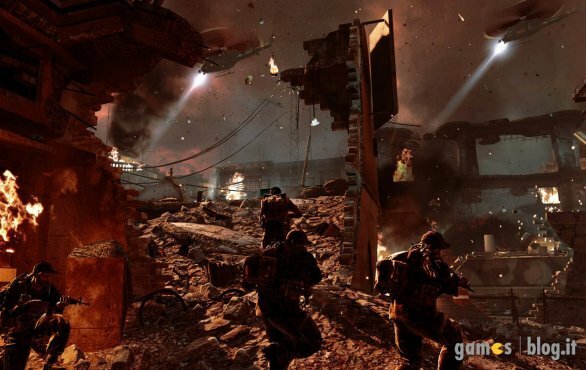 Prima di lasciarvi agli obiettivi sbloccabili, vi ricordiamo che Call of Duty: Black Ops uscirà il 9 Novembre su PC, PlayStation 3, Xbox 360 è Nintendo Wii. Once a Hero... (25 points): Complete "DogTags" on Veteran Difficulty. (Solo Only). The Lion Sleeps (25 points): Complete "The Wild" on Veteran Difficulty. (Solo Only). Here Comes The Chopper (25 points): Complete "Blue Skies" on Veteran Difficulty. (Solo Only). Absolute Zero (25 points): Complete "Chills" on Veteran Difficulty. (Solo Only). Avalanche (25 points): Complete "The Peak" on Veteran Difficulty. (Solo Only. A Walk In The Park (25 points): Complete "Summertime" on Veteran Difficulty. (Solo Only). Lovely View (25 points): Complete "To The Top" on Veteran Difficulty. (Solo Only). New Neighbours (25 points): Complete "Coming To Town" on Veteran Difficulty. (Solo Only). Embargo (25 points): Complete "Port of Disaster" on Veteran Difficulty. (Solo Only). This Town Aint Big Enough (25 points): Complete "A City in Flames" on Veteran Difficulty". (Solo Only). Knowledge Is Power (25 points): Complete "For the Greater Good" on Veteran Difficulty. (Solo Only). Room 101 (25 points): Complete "Torture" on Veteran Difficulty. (Solo Only). Puppets (25 points): Complete "Orders" on Veteran Difficulty. (Solo Only). Defiance (25 points): Complete "Rebel With A Cause" on Veteran Difficulty. (Solo Only). 1984 (25 points): Complete "Exposed" on Veteran Difficulty. (Solo Only). Everyone Achieves More (25 points): Complete "Old Friends" on Veteran Difficulty. (Solo Only). ...Always A Hero (25 points): Complete "The Final Stand" on Veteran Difficulty. (Solo Only). No Guts... (10 points): Complete a Level without firing a single shot. Devastator (25 points): Kill 100 Enemies in 30 Seconds in "A City in Flames". Invincible (15 points): Survive "Torture" without dying on Hardened or Veteran Difficulty. (Solo Only). Tree Hugger (15 points): Complete "The Wild" without burning any of the jungle. A Kind Heart (10 points): Complete "Rebel With A Cause" without killing any innocent civilians. What Comes Around... (10 points): Kill 10 Soldiers with ricochet bullets. Real Estate Aint Cheap (25 points): Destroy all the Landmarks in "Blue Skies". (Solo Only).